Amenities: Inside full bathroom tub/shower, the kitchen offers a stove, dishwasher, microwave, refrigerator/ice maker, and every kind of kitchen gadget you can imagine, including a coffee grinder. Washer/dryer, TV with satellite and VCR. Outdoor gas grill and private outdoor shower with hot and cold water. 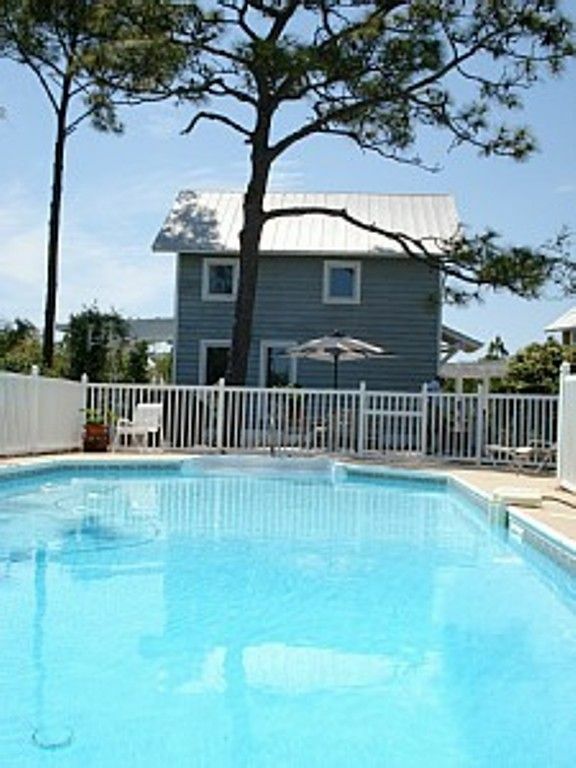 Access to private pool and hot tub.shared with one other cottage for two. My first career was in the USAF. I discovered the area when I was stationed at Eglin AFB in the 33rd Tactical Fighter Wing flying the F4E.. My second career was with Verizon Wireless and when I travelled which was a lot I was always looking for a place to retire. I kept being drawn back to the beautiful beaches of the Emerald Coast. When I moved to Nashville a friend suggested I buy a house in Destin since I was always talking about the beaches.. Three weeks after that conversation I came down for the weekend and purchased my home in South Walton County next to the Topsail Preserve. The architect gave me plans for a cottage and two years later I built the Little Cottage. The area has grown quite a bit since my arrival with many positive additions to our community from shopping . grocery stores, bike paths, , fabulous restaurants and a first class Hospital. Even though I traveled extensively in both my careers and lived all over the states as well as overseas it is hard to pry me away from Santa Rosa Beach.. The Little Cottage is quite unique based on its location near the Topsail Preserve and the areas amazing beaches. You will be hard pressed to find a private one bedroom cottage with a 38 foot pool on one side and a hot tub on the other surrounded by nature. I'm just sayin! Fantastic property and close to everything we needed. The owner Bill was great to work with, we will certainly be back! This cottage was truly incredible. It was very cute and met every need. Very close to Walmart for shopping. About a mile and a half from the nearest public beach access to the prettiest beach I’ve ever been to. About 2-3 miles to another beach access where there is food and shops. One of the best vacations I’ve taken! Great Cottage, Great Owner, Great Location, and Great Vacation! This was the second time we stayed at the Little Cottage and it just keeps getting better! The only thing that can beat a 30-day stay is 31+. See you soon, Bill. Great location, close to the beaches and shops, but not the traffic! Enjoyed watching wild life in back yard, taking walks, and riding bikes in the area. Host was super! He jumped on our water filter problem right away, got the replacement parts and up and running in no time at all. Cottage was neat, clean, and well stocked with linens and in the kitchen. Books and games were provided for a quiet evening at home. The pool and hot tub weren't used but were available and well maintained. Parking was secure and hassel free. Another great stay at your place! Only problem was it wasn’t long enough. Thank you for the great hospitality. Oh and pictures really don’t do this property justice. I love the back porch covered in vines overhead, it’s so serene. $700-895/Week Our rates are seasonal. The only addition to the rates, will be a 11% bed tax. We will require 1/2 of the amount for a deposit and the balance due at check in. We accept personal checks, cash or money orders.. The Little Cottage is for two people only no additional overnight guests.